So i would like to make a classic forge, the kind where you have a trough made from the ceramic bricks and steel casing, and bellows, an anvil, etc. Im new at this, so go easy on me, lol. I have so many questions. What is tempering? Normalizing? Should i use oil or water for quenching? what hammer should i get? What's the easiest metals to work for a beginner? How would i go about this? I would like to know any details, as this is my first attempt into blacksmithing. 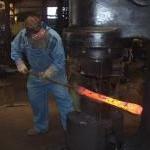 I used to cast aluminum, but i never had a real forge or anything. Just a trash can filled with cement, and a hole in it for a pipe with a hair dryer as a fan lol. Welcome Mango, glad to have you. If you'll put your general location in the header you might be surprised how many members live within visiting distance. My advice for the beginner goes like this. Don;t try to decide on tool and equipment design or type, you don't know enough to know what you like or need or works for you. For example a classic forge is a hole in the ground, a couple pieces of bamboo, one large one with feathers on a stick to pump air and smaller diameter one covered in mud as the air blast. Check out the JABOD forge it's a side blast consisting of: a box of dirt, a couple bricks, a piece of pipe, an air pump and fuel. The basic design is as old as humans have been forging metal and as effective today as it has ever been. Okay the early models didn't have the box. So shoot me. Forget about heat treating till you've learned some basic blacksmithing. You'll get an introduction soon enough making your punches, slitters and chisels to use at the anvil. Just don't worry about it now. Any smooth faced hammer in the 32 oz. range is a good start, I recommend a 2 lb. Drill Hammer. It has enough weight to do good work but not so heavy as to be too tiring or likely to do injury before you develop the skills and muscle to use heavier safely. Drill hammers also have a shorter handle so they're easier to control and control is EVERYTHING at the anvil. Make sense? Start hitting: garage, yard, rummage, etc. sales for tools. Any smooth faced hammer cross pein or ball peins again, 2 LBS and UNDER if you pick up heavier put it aside till you have some experience. You won't regret it like you would blacksmith's elbow and shoulder, soft tissue damage is no joke. Ball pein hammers are always on my buy list if they're cheap or extra nice, I see them regularly for under $1 and ones with broken or missing handles usually go for $0.50 or less. You'll want to put a handle on that fits you anyway, I sure do. You can easily forge ball pein hammers into a wide range of top tools and you'll want top tools. To begin just buy a stick (20') of 1/2" round or 3/8" square low carbon Hot rolled steel. Using found steel is fine but learning how to evaluate mystery metal is another skill set you don't really need to mess with at first. A new stick of mild steel gives you consistent stock, it will behave the same: under the hammer, in the fire, bending, twisting, punching, grinding, etc. every time you put a new piece in the fire. There's a section here for the beginner with: How to set up your tools and equipment, what to build, how and why. How to build and maintain the fire. etc. and a number of good projects to get you started. Fire tools are good first projects. How's that for easy on ya? Truth is blacksmithing is addictive and we're like friendly pushers always happy to get someone new hooked. Just be ready for more fun than should be legal. Welcome. I am also a very new smith. The one thing that I can add is go through the sections and read all the stickys(the locked in place threads). They have the most focused information and are a great starting point for learning what you think might work for you. Wish I had read them before I made my first forge. Most of my blacksmithing doesn't involve quenching so that question is moot. In general if you are trying to harden with a quench---what you use depends on the alloy, cross sectional area and intended use. It could be Air, Oil, Water, Brine,...and sometimes followed by a cryro quench. Welcome Mango, glad to have you. Just be ready for more fun than should be legal. What you described as a forge fits my preexisting forge already! I will have to clean up my old forge, its filled with old cigarette buds lol. it is just a small 5 or 3 gallon galvanized bucket with a 3 inch lining of concrete around the interior, and a small pipe for attaching to a hairdryer. Would that work? I mean, i still probably need an anvil, tongs, gloves, and hammer, and i do have my eye on a nice 2 lb hammer i found. I just want to forge knives, so i do plan on eventually getting a small forge with a burner and everything for it, but that day is not today, lol. A lot cheaper and better for the ego to learn the basics on mild steel and then start evolving towards the HC stuff. Each section of the site is subject oriented so look for anvils in the anvil section, etc. Look for the logical starting points such as A collection of improvised anvils to get started with anvils, or the 55 Forge or JABOD in the forges section. The pinned and stickies in each section contain a wealth of information. The more you read the more money you do not have to spend. We suggest you pack a lunch and a cold drink before you visit the site. t is just a small 5 or 3 gallon galvanized bucket with a 3 inch lining of concrete around the interior, and a small pipe for attaching to a hairdryer. Would that work? No, it's unsafe on several fronts besides being a poor shape. Overheating galvanized puts zinc oxide smoke in the air and it's a health hazard. B-A-D-N-E-S-S for your lungs. When you heat concrete much above the boiling point of water it starts spalling, (blowing chips explosively). Pieces of HOT concrete flying in the air is B-A-D-N-E-S-S sticking to your hide and burning. NO CONCRETE or GALVANIZED steel touching the fire! Making knives without knowing how to draw a straight taper? Why make it harder to learn the craft than necessary?